To download a resource from the list below, simply click the title (highlighted in pink) and save to your computer. Presentation 2- Introduction to ABW18 (F-KS2) F – KS2 Power Point presentation to introduce ABW18 among primary school aged children. 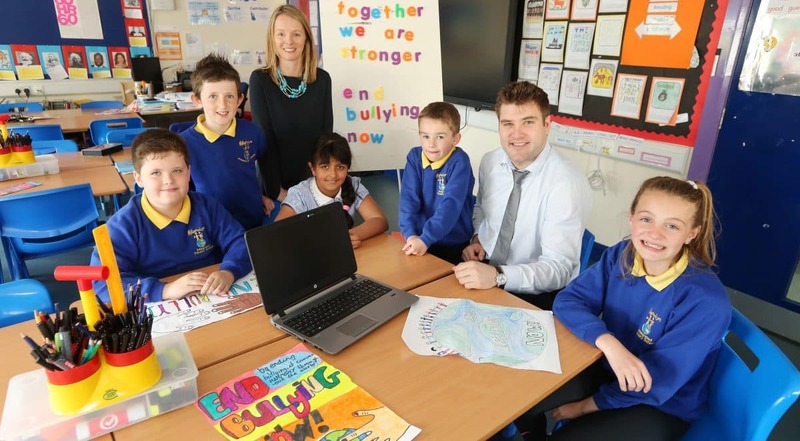 Presentation 3 – Time to Act KS1 – KS2 PowerPoint exploring ABW18 and responses to bullying through RESPECT. Presentation 4 – Introduction to ABW18 KS3+ KS3 – KS4+ Power Point presentation to introduce ABW18 among post-primary school aged young people. Presentation 5 – My Story (ABW18 Posters) KS3 – KS4+ Scripted monologues exploring bullying situations illustrated in the ABW18 posters. Activity 1 – Everyone is Different, Everyone Deserves Respect F – KS1 Story based activity on theme of individuality and RESPECT. Activity 2 – Barney Teaches Respect F – KS1 Activity based on clip of a song from the TV show ‘ Barney’, exploring the meaning of RESPECT. 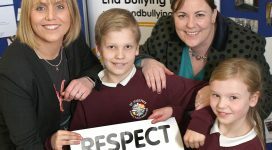 Activity 3 – Respect is All Around F – KS2 Presentation and activities to encourage children to think about how RESPECT is displayed. Activity 5 – Time to Act KS1 – KS2 Scenario based activity encouraging RESPECT for yourself, RESPECT for the environment and RESPECT for others. Activity 6 – Golden Rules of Respect KS1 – KS2 Based on clips from the movie ‘Matilda’, this activity explore how we show RESPECT to others. Activity 7 – How Respect Grows KS2 Two-part activity exploring how we build relationships on RESPECT. Activity 8 – What do you do KS2 – KS3 Scenario based activity exploring respectful responses to bullying situations. Gníomhaíocht 8 – Ceardlann ar an Mheas KS2 – KS3 Activity 8 in Irish. Activity 9 – ‘Why are you doing this to me’ (Time to Stand) KS2 – KS3 Film based activity exploring a scenario of disrespect and racial bullying. Activity 10 – Principles of Respect KS3 – KS4 Project based activity challenging young people to explore how respectful behaviour can create a safer environment online. Activity 11 – ‘It’s just so different round here’ (Time to Stand) KS4+ Using the film from Activity 9 as a stimulus, young people are challenged to develop a public awareness campaign around bullying, harassment and hate crimes. Informed by latest PSNI statistics. Gníomhaíocht 11 – Tá sé chomh difriúil thart faoin áit seo -Seasaimis! KS4+ Activity 11 in Irish. Activity 12 – I Needed to Learn I Needed to Listen KS4+ This activity uses a TED Talk by controversial figure Megan Phelps-Roper to generate discussion around the balance between freedom of speech and the need to show respectful behaviour, particularly online. Printed copies of the posters have been sent to all registered schools and organisations. Follow the links below to download the posters, which you can print or display on digital screens. Both English and Irish language versions are available, and posters can be downloaded in PDF and JPEG formats. Affirmation Activity All This lesson explores how words and actions can make other people feel and what affirmation looks and feels like. Rainbow Fish Foundation This lesson explores understanding and identifying the benefits of sharing. I am a masterpiece KS1 This lesson explores how children can develop an understanding and appreciation of the differences between themselves and others. Same only Different KS1 This lesson explores how children can develop awareness of diversity, identify individual similarities and differences and promote positive relationships, through partner work. Friendship Garden KS1 & KS2 This active lesson aims to develop each child’s awareness of diversity and promote positive relationships, through partner work. Can you carry this? KS2 This lesson explores how children can recognise and identify bullying behaviours, understand how they can help others who are being bullied and recognise the impact that small actions can have on another person. Sammy’s Shoes in Irish KS1 & KS2 This lesson explores how children can develop a greater understanding of what makes a good friend and increase their acceptance and awareness of difference specifically of autistic behaviour. Disablist Bullying KS3 & KS4 This lesson explores what disablist bullying is, who is affected, where, when and why as well as classroom strategies to combat disablist bullying. Together we Will KS3 & KS4 This lesson explores the term and features of bullying, understanding the role of the bystander and evaluating responses to bullying behaviours. Writing to Local Media All This activity encourages young people to find out about their anti-bullying policies and to share what young people and their school are doing about addressing bullying. about Bullying. All This Top Ten Facts resource can be used in school to learn more about the issue of bullying, encourage conversations about this issue and can also be sent home as ‘homework’ for children & young people to discuss the facts about bullying with their parents/carers. What we do about bullying All NIABF recommend this flyer is personalised then sent home to parents/carers for their information and can also be uploaded to your school/youth group website & social media sites. Northern Ireland Anti-Bullying Forum Parent/Carer Toolkit, 2017 Parents/carers A useful toolkit aimed at providing parents and carers more information and advice about dealing with the issue of bullying. You’ve got a friend in me KS 1 Activity to help with understanding the difference between good and bad behaviour in friendships and how a friend may feel if they are being bullied. Bullying Never Wins KS1 & 2 Activity for children to learn to recognise how bullying can negatively impact others and be able to express their thoughts and feelings in a creative way. Helpful ways to recognise that bullying is wrong and they can stop it occurring. Sammy’s shoes KS 1 & 2 The resource is made up of a big book called Sammy’s Shoes which illustrates how children are bullied because of their special or additional needs and three related activities. The big book is about Sammy who is bullied because of his autism, it asks questions about bullying behaviour and puts children in the shoes of someone who is being bullied. Partner Portraits KS 1 & 2 Art & Design activity to recognise, in a positive way, physical and emotional attributes of their partner & help understand diversity within the classroom. Friendship Fish KS 1 & 2 Activity to help children understand how their words and actions affect others, about the qualities and attributes of a good friend and to help them think about ways to support others around them and why it is important to do this. Standing up to Hurtful and Bullying Behaviour KS 2 & 3 Activities to discuss common ways people can show their feelings through hurtful behaviour rather than relying on hurtful or unspoken behaviours. The Uprising Project KS 3 & 4 Activity to help discussions that children’s peers have differences and empathising with others who have experienced discrimination. How To Write To Local Media All To help raise awareness of ABW16 we would encourage young people to write to their local media about what they, and their school or group are doing about bullying. This resource is a draft press release for you to personalise. Top Ten Facts for children to tell their Parents & Carers about Bullying. All This Top Ten Facts resource can be used in school to learn more about the issue of bullying, encourage conversations about this issue and can also be sent home as ‘homework’ for children & young people to discuss the facts about bullying with their parents/carers. Northern Ireland Anti-Bullying Forum Parent/Carer Toolkit, 2016 Parents/carers A useful toolkit aimed at providing parents and carers more information and advice about dealing with the issue of bullying.